The 134-member Group of 77, the largest single coalition of developing countries, has expressed serious concern over the “unprecedented” withdrawal of nine member states from the Vienna-based UN Industrial Development Organization (UNIDO). Over one hundred developing countries continue to be left out of global tax cooperation negotiations despite leaks such as the Panama papers showing the high cost of tax avoidance. The key priorities of the Group of 77 developing countries (G77) remain somewhat aligned around a set of issues that have been present from the beginning of the FfD negotiations in New York. Public funds are vitally important to achieving the Sustainable Development Goals (SDGs), making corporate tax avoidance trends a pressing issue for post-2015 Financing for Development discussions. The Group of 77, the largest single coalition of developing countries, is hitting back at New York City banks that arbitrarily cancelled the accounts of more than 70 overseas diplomatic missions, leaving ambassadors, senior and junior diplomats and non-diplomatic staff without banking facilities. 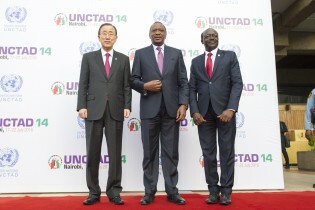 The 132-member Group of 77, the largest single coalition of developing nations, has urged Secretary-General Ban Ki-moon to provide, "as soon as possible...alternative options for banking services" in New York City following the mass cancellation of bank accounts of U.N. missions and foreign diplomats. Hundreds of representatives from various NGOs walked out of the negotiating rooms at the United Nations climate talks in Poland on Thursday in protest against the reluctance by developed nations to commit towards achieving a global climate treaty. The G77+China group of 133 developing countries negotiating a new international deal at COP19 in Warsaw to combat climate change walked out of the talks in the wee hours of Wednesday morning to protest developed countries’ reluctance to commit to loss and damage.